We tested Chain-Vey's claim of gentleness on one of the industry's most fragile and premium nuts: pistachios. 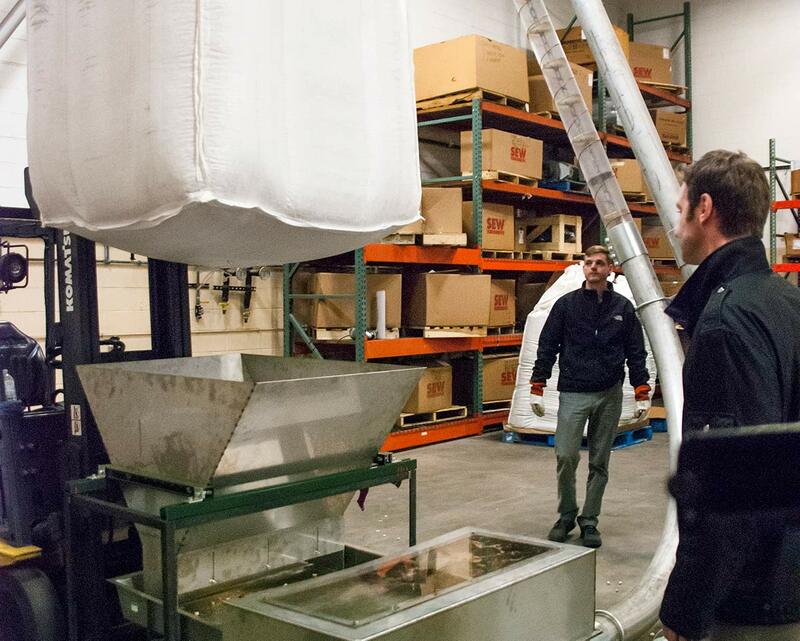 We took samples at various pocket fills and conveyor speeds. The results speak for themselves. 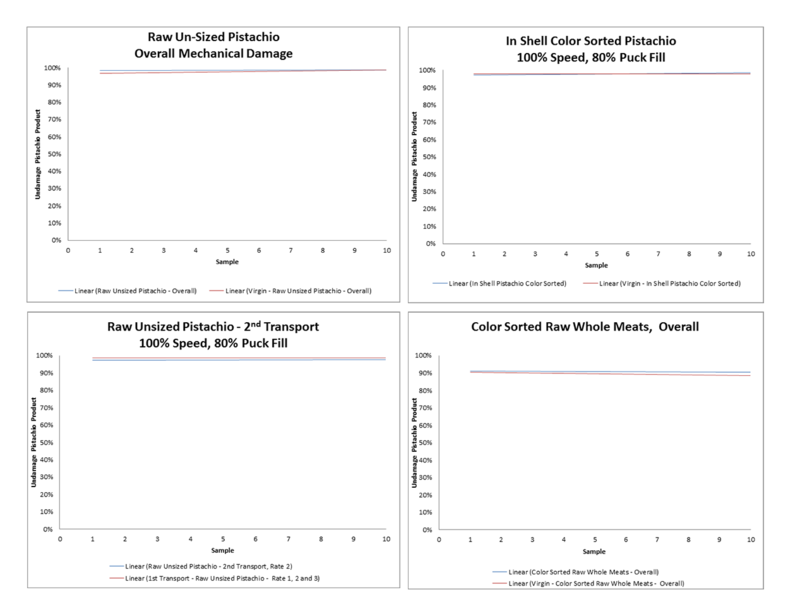 Mechanical damage test data verified by hand sorting shows that Chain-Vey conveyance systems introduces little or no mechanical damage to both in-shell and kernel pistachios. Test data show that mechanical damage after conveyance was less than 1% for both in shell pistachio and pistachio kernels. Test data also shows that virgin product (non-conveyed) itself has up to 1% of product damage plus or minus one standard deviation. Therefore of the less than 1% of product damage, it cannot be attributed to conveyor damage. The same results were found from Chain-Vey 2nd product transport. In short, for all speeds and puck fills Chain-Vey, yield loss due to product damage is indetectable. Or in another word: zero. The origin of the pistachios used for testing was from Paramount Farms Preprocessing Facility in Lost Hills, California. The in-shell and kernel pistachio selected were cleaned and color sorted. 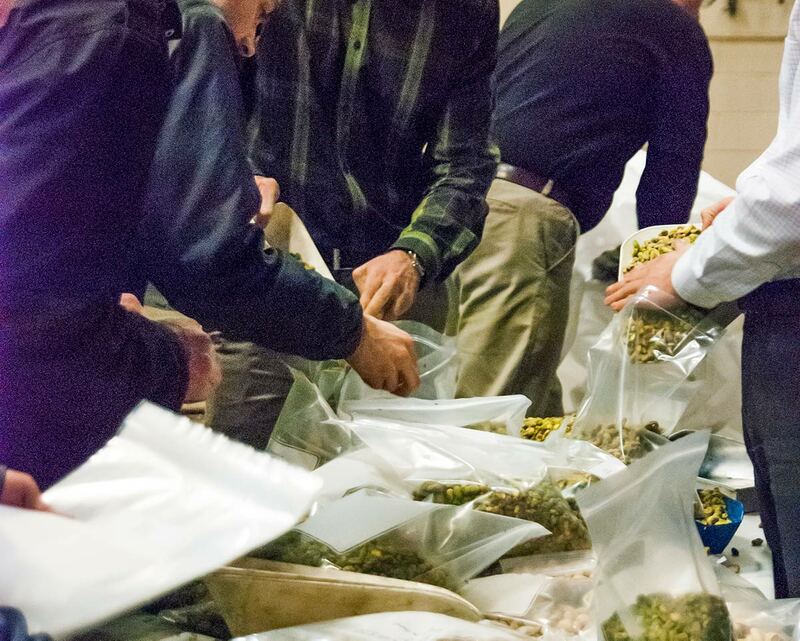 Random samples of 500g were taken before each product run inside the conveyor as well as at the end of each run. The sample mean, variance, and standard deviation were calculated for all data collected. The sample standard deviation was used to measure the variability of the data collected from the mean. The conveyor system tested was a 200 ft long, 6” diameter Chain-Vey. Puck fill was controlled using a FMC vibratory feeder. Speed of conveyance was control using a Variable Frequency Drive (VFD) in the drive unit. In addition, precautions were taken to ensure that minimum product mechanical damage was introduced at product transfer points during in feed and discharge of product. All transition points were smooth and in the direction of product flow. Finally, before all data collection and recording all equipment was calibrated. Before any of the test product runs, virgin random samples of pistachio were collected to estimate percent of product damage in test batch. All Chain-Vey conveyor system configurations were run for about 30 seconds. During each test, Chain-Vey conveyance speed and percent fill were validated. 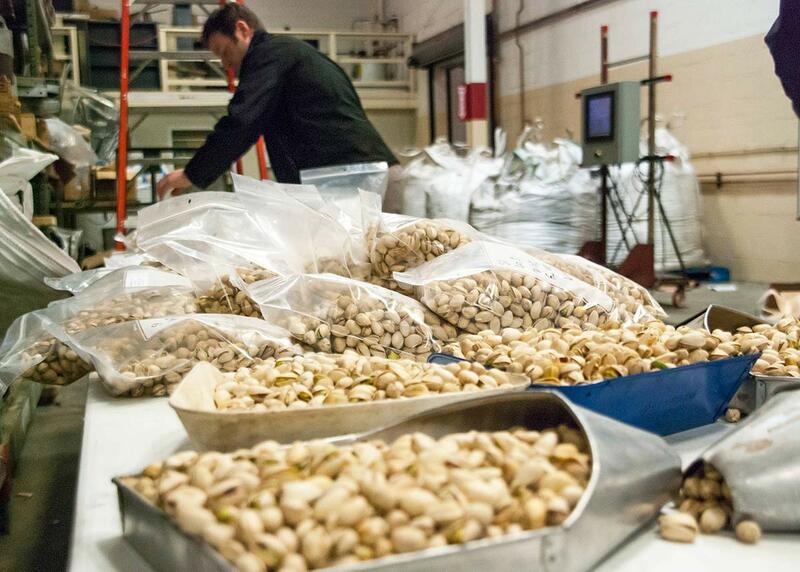 To test for mechanical damage, 500 gram samples of pistachios were collected during the entire duration of test run. The test samples were visually inspected and separated into categories, mechanical damage or acceptable product. The acceptable and damage product were then weighted and percent accepted and damaged were calculated. Chain-Vey conveyor capacity was calculated using time conveyance run and weight of product transfer. This was calculated at all test runs. Upper left: Linear graph of 10 samples on X-axis with percentage of undamaged raw un-sized pistachios on Y-axis. Upper right: Linear graph of 10 samples on X-axis with percentage of undamaged color sorted pistachios (100% speed, 80% fill) on Y-axis. Lower left: Linear graph of 10 samples on X-axis with percentage of undamaged raw un-sized pistachios 2nd transport (100% speed, 80% fill) on Y-axis. Lower right: Linear graph of 10 samples on X-axis with percentage of undamaged color sorted raw whole kernels overall on Y-axis. The data supports Chain-Vey's claims of gentleness and integrity preservation during conveyance. The purpose of this test is not to compare Chain-Vey to competing conveyors, but to rule out any question of product damage during conveyance on a particularly fragile product like pistachios. The data suggest Chain-Vey as an ideal conveyor, with the authors noting that no other conveyor could measurably outperform the Chain-Vey, as no statistically measurable breakage could be found at all. The results may suggest Chain-Vey as an ideal conveyor for many other fragile foods as well.